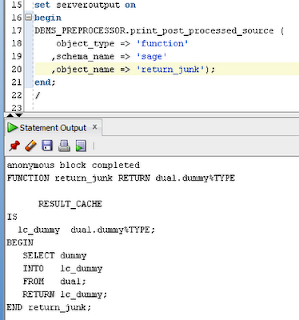 If yesterday's post got you in the mood to investigate Oracle 11g, here is a quick demonstration of the resultant end of your conditional compilation usage. 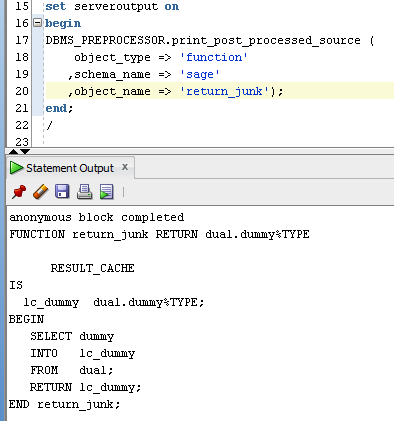 In the accompanying image, you can see I've determined what the interpreted code will be, compiled in 11g, the RESULT_CACHE feature is present. Had I compiled this in 10g, line 2 & 3 will be completely clear and you would not have 11g technology causing syntax errors in your 10g database. At least you added in the code when you became aware of it a it didn't get forgotten about!